A blackboard displays the menu at a cafe along the Rue Saint-Paul in Old Montreal in Montreal, Quebec, Canada. 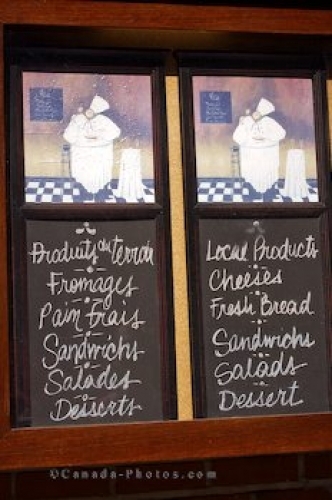 Written in both French and English, the menu for a cafe along Rue Saint Paul in Old Montreal in Quebec, Canada is displayed on a blackboard. Tourists that do not speak French are pleased to see the menu in both languages as it makes it easy to decipher what they should have for lunch. Cafe menu blackboard along Rue Saint-Paul in Old Montreal, city of Montreal, Quebec, Canada. Picture of a menu for a cafe along the Rue Saint Paul in Old Montreal in Montreal, Quebec.